Bus from Kuantan to Muar is an important mode transport to travel from Kuantan to Muar. That is because there is no train and flight service available between the two cities. Therefore, bus become the only transportation option to travel to Muar from Kuantan. Transnasional and Cepat Express are two bus companies offering bus from Kuantan to Muar. Their combined trips have total 4 daily departures. With these excellent and quality service provided by Transnasional and Cepat Express, they become the local favourite choices to travel from Kuantan to Muar. Both of the bus operators deployed 30-seaters VIP coach to serve passengers. The first bus starts at 1:00am. The following bus schedules are 9:00am, 1:30pm and 4:30pm. The duration required to travel from Kuantan to Muar by bus is approximately 5.5 hours depending on the traffic condition. At least one stopover will be given for passengers to go for washroom or have a short break at the rest stop. If you need an extra washroom break, you can request from the bus driver during the journey. The bus ticket price from Kuantan to Muar is charged reasonably in a range from RM 24.10 to RM 25.90 depending on your choice of bus operator. Cepat Express is offering child care as discount for passengers travelling with children. The boarding point in Kuantan is located at Kuantan Sentral Bus Terminal. The arrival point in Muar is located at Muar Bus Terminal. 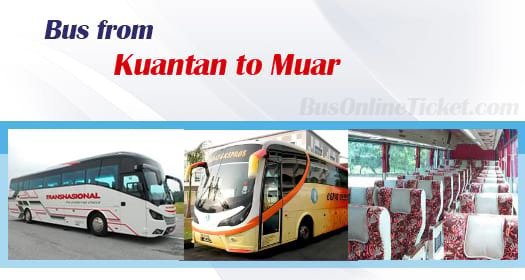 Book your bus ticket from Kuantan to Muar with BusOnlineTicket.com now to save your money and time to travel to the counter just to buy a ticket. You would receive instant confirmation email upon payment is successfully made through our secure payment method such as internet banking, Paypal, credit card, Alipay and etc. Online booking will give you a piece of mind that your seat is reserved before your trip.